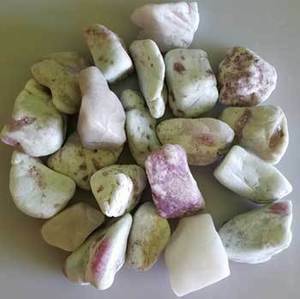 Known for emotional and spritiual healing., a thymus or heart based stone. Pink Toumaline promotes joy, hapiness, and love. Known to help emotions and moods, the passion of living. Sold by aproximate weight - not stone size or count. 67 - 74 stones. 1"x1 1/2" - 3" x 1 1/2".